In trying to keep the Panasonic TX-L50E6B affordable it seems that one or two corners have been cut. And cutting corners off a TV is never a good thing. TV screen sizes are definitely on the up, with more and more of us looking to buy the largest possible model we can afford. The sight of a 50-inch screen in the average living room that would not so long ago have seemed outrageous now seems perfectly reasonable, a trend that's been fuelled largely by the erosion of LED and plasma screen prices. The edge-lit Panasonic TX-L50E6B is aimed at anyone seeking a stylish, affordable 2D-only 50-inch screen with smart TV capability. By sacrificing many of the features that enhance the performance of its more expensive models, Panasonic has delivered a big screen with a basic spec in terms of picture processing. But there's a good reason why better specced screens feature faster processors, special filters and local dimming, and by compromising the features list you run the risk of compromising performance to an unacceptable level. At £899 (around US$1,392 / AU$1,346), the Panasonic TX-L50E6B is certainly a good price, though. There are four 50-inch screens in Panasonic's lineup this year, with the step-up £1,300 Panasonic TX-L50ET60B offering a 176-degree IPS panel, 600Hz processing, a Clear Panel Pro filter and passive 3D playback. For 1,000Hz and dual-core processing, along with ISFF calibration and twin tuners, look to the Panasonic TX-L50DT60B, while to save a few bucks you could always go for the bargain basement E series and EM series models, which are bereft of all networking and smart TV functions. No rival manufacturers have landed their 50-inch LCD screens for 2013 yet, although Samsung's F6100 series is imminently expected, which adds 3D playback and 200Hz for a little extra cash. The decision not to include 3D in the spec seems logical from a pricing perspective, because adding it would require a different panel along with faster processing. Manufacturers may finally be admitting that 3D is no longer the draw they predicted it would be. Even if you do want 3D on a Panasonic screen you have to be prepared to go passive rather than active. Other areas of the Panasonic TX-L50E6B's specifications that may cause concern are the basic 100Hz (plus backlight blinking) refresh rate, the absence of a Hexa (dual-core) processing engine and 24p Blu-ray playback, the non-Clear Pro filter, the lack of ISFF calibration modes and an inability to use a USB connected hard disk as a PVR. Voice control, which appears on more expensive models, is probably not worth sweating over, being often as effective as a megaphone in a vacuum. In two areas the Panasonic TX-L50E6B's spec is happily almost on a par with most of the screens above it. The slimline design looks terrifically classy, using the 'super narrow' bezel that, seen from the front, is just 5mm (0.2 inches) wide. The glass of the nicely non-reflective screen masks the 5mm-wide black border that appears when the screen is switched on, helping to boost contrast at the edges. Along the bottom edge is a translucent, slightly curved plastic strip that offsets the screen's square edges. Another area of near-parity between the Panasonic TX-L50E6B and its otherwise better equipped siblings is in terms of its smartness. 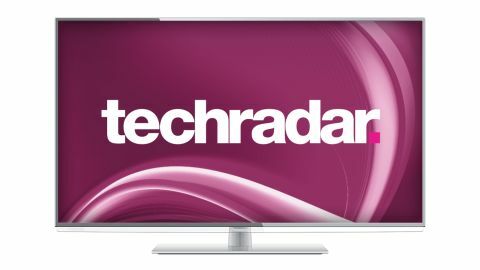 The screen features a customisable home screen, a web browser, built-in wireless networking and access to the HTML5-compatible Viera Connect smart TV portal. Finally, connectivity is also almost identical, with the standard Viera provision of three HDMIs, plus there are two USBs, headphones, optical audio out and an Ethernet port, and the usual legacy analogue fayre. The handy Panasonic SD card bonus is absent. Note that the HDMIs are all rear-facing, which is fine for stand mounting but does limit how close you can fix the screen to a wall - depending on the thickness and stiffness of your HDMI cables. Naturally, a standard remote control handset is supplied, but the Panasonic TX-L50E6B can also be operated using Panasonic's revamped smartphone and tablet app, including the clever Swipe and Share feature that enables you to send pics and videos from your portable device to the TV or stream content in the opposite direction (from a USB drive), without even turning the TV on. Second screen viewing is not available, partly because the TV only has one tuner.